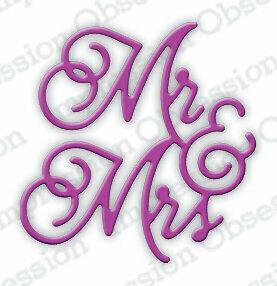 Marriage themed Impression Obsession die featuring "Mr. & Mrs.". US-made steel die compatible with most table-top die cutting machines. This is a single die measuring approximately 1-5/8 x 1-5/8 inches. This interlinked ring set is ideal for use on wedding invitations, shower thank you's, or even scrapbook pages celebrating the big day. Image measures approximately 1-3/8" X 1-1/8". High quality, precision, stainless steel stencil. Wedding themed Impression Obsession die featuring the word "Love". This is a set of 5 dies. 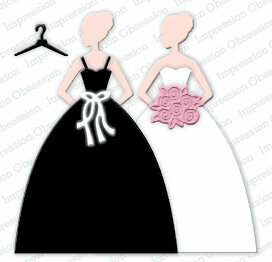 There is a gown, a torso, a bouquet, a hanger, and bow. The gown measures 2-1/4 x 2-3/4 inches. Marianne Design Creatable: Tiny's Wedding. Build a wedding scene with this wedding couple. 1 die. Size: 1.25" x 2.75". Craft die from Crafter's Companion featuring a pair of birds. 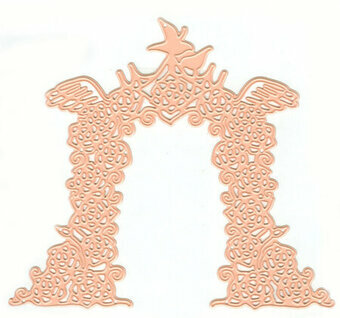 Tessler Crafts Dies - Rose Arch Way. Size: 5" x 4 1/4". Paper craft die featuring a Chapel. CottageCutz are thin metal dies, like a QuicKutz. They are easy-to-use and add great detail to any craft project. This die is compatible with the following machines: QuicKutz Squeeze, Revolution, Sizzix / Ellison Big Shot, BigKick, CuttleBug, SpellBinder Wizard and Accucut Zip'eMate. Adapters/shim may be required on some machines. Made in the USA. 100% lead free. Wedding themed craft die featuring a Wedding Horse & Carriage. CottageCutz are thin metal dies, like a QuicKutz. They are easy-to-use and add great detail to any craft project. They are universal and easy to use with the following machines: Sizzix Big Shot, Sizzix BIGkick, Provo Craft Cuttlebug, Spellbinders Wizard, Spellbinders Grand Calibur, QuicKutz Revolution and QuicKutz Epic. Adapters/shim may be required on some machines. Made in the USA. 100% lead free. Craft die from Crafter's Companion featuring the word "Love". Wedding themed paper craft die featuring a Rose With Wedding Rings. CottageCutz are thin metal dies, like a QuicKutz. They are easy-to-use and add great detail to any craft project. This die is compatible with the following machines: QuicKutz Squeeze, Revolution, Sizzix / Ellison Big Shot, BigKick, CuttleBug, SpellBinder Wizard and Accucut Zip'eMate. Adapters/shim may be required on some machines. Made in the USA. 100% lead free. Wedding themed paper craft die featuring a Tiered Wedding Cake. CottageCutz are thin metal dies, like a QuicKutz. They are easy-to-use and add great detail to any craft project. This die is compatible with the following machines: QuicKutz Squeeze, Revolution, Sizzix / Ellison Big Shot, BigKick, CuttleBug, SpellBinder Wizard and Accucut Zip'eMate. Adapters/shim may be required on some machines. Made in the USA. 100% lead free. 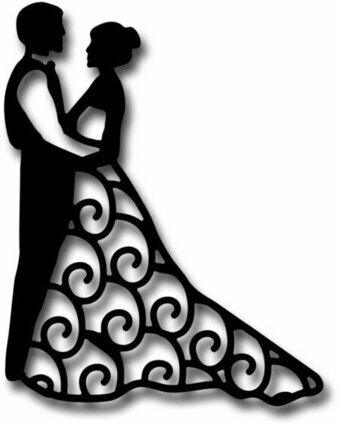 Wedding and love themed embossing folder. Show your significant other how you feel with cards made using this Forever and Ever embossing folder. This 4.25 x 5.75-inch crafting guide lends texture to card stock, and you can use it over die-cut designs to add extra detail. Craft die from Crafter's Companion featuring the word "Hope". Wedding themed Impression Obsession die. US-made steel die compatible with most table-top die cutting machines. This is a set of 3 dies. The letters are approximately 5/8 inches tall. 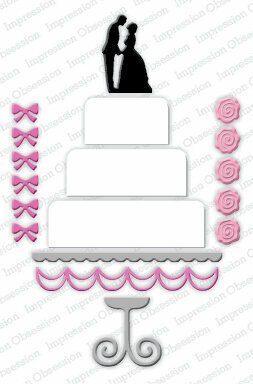 Wedding themed dies featuring the bride and groom on a wedding cake. This is a set of 9 dies. The cake pieces are 5/8 x 1-1/8 inch, 5/8 x 1-5/8 inch, and 5/8 x 2-1/8 inch. The roses are around 3/8 inch. The bows are 1/4 x 3/8 inch. Love themed Impression Obsession die featuring a boy holding flowers. This die measures 1-1/8 x 2-3/4 inches. 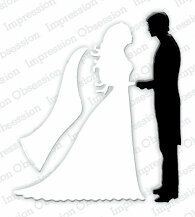 Wedding themed Impression Obsession dies featuring the Bride and Groom. This is a set of 2 dies. 2-3/8 x 2-5/8 inches. 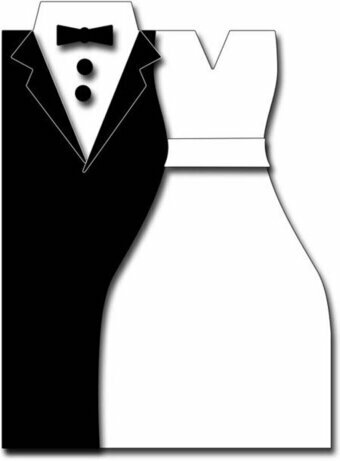 The bride and groom silhouette die measures 2.3" x 2.9". What a beautiful way to wish the new couple a happy life. Our Frantic Stamper Precision Dies work in most consumer table top die cutting machines such as the Cuttlebug, Big Shot, vagabond, Boss Cut, and Grand Calibur. Some dies may require the use of a metal shim depending on your machine. Paper craft die featuring wedding accessories for the Bride including shoes, earrings, a purse, and more. CottageCutz are thin metal dies, like a QuicKutz. They are easy-to-use and add great detail to any craft project. This die is compatible with the following machines: QuicKutz Squeeze, Revolution, Sizzix / Ellison Big Shot, BigKick, CuttleBug, SpellBinder Wizard and Accucut Zip'eMate. Adapters/shim may be required on some machines. Made in the USA. 100% lead free. Wedding themed paper craft die featuring Bridal Lingerie. CottageCutz are thin metal dies, like a QuicKutz. They are easy-to-use and add great detail to any craft project. This die is compatible with the following machines: QuicKutz Squeeze, Revolution, Sizzix / Ellison Big Shot, BigKick, CuttleBug, SpellBinder Wizard and Accucut Zip'eMate. Adapters/shim may be required on some machines. Made in the USA. 100% lead free. Wedding themed paper craft die featuring Wedding Bells With Bow. CottageCutz are thin metal dies, like a QuicKutz. They are easy-to-use and add great detail to any craft project. This die is compatible with the following machines: QuicKutz Squeeze, Revolution, Sizzix / Ellison Big Shot, BigKick, CuttleBug, SpellBinder Wizard and Accucut Zip'eMate. Adapters/shim may be required on some machines. Made in the USA. 100% lead free. Wedding themed paper craft die featuring a Wedding Chapel. CottageCutz are thin metal dies, like a QuicKutz. They are easy-to-use and add great detail to any craft project. This die is compatible with the following machines: QuicKutz Squeeze, Revolution, Sizzix / Ellison Big Shot, BigKick, CuttleBug, SpellBinder Wizard and Accucut Zip'eMate. Adapters/shim may be required on some machines. Made in the USA. 100% lead free. Wedding themed paper craft die featuring a Wedding Dress. CottageCutz are thin metal dies, like a QuicKutz. They are easy-to-use and add great detail to any craft project. This die is compatible with the following machines: QuicKutz Squeeze, Revolution, Sizzix / Ellison Big Shot, BigKick, CuttleBug, SpellBinder Wizard and Accucut Zip'eMate. Adapters/shim may be required on some machines. Made in the USA. 100% lead free. 25pack, 5 designs, gold foil accents, printed lines on reverse. 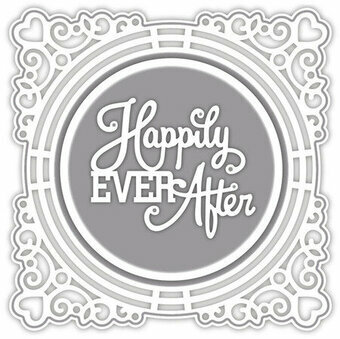 Wedding themed craft dies featuring the sentiment "Happily Ever After". Compatible with most die-cutting machines. Add a touch of classic romance to any paper crafting project with either of the gorgeous, exquisitely detailed and intricate dies found within the Decorative Medallion Die. Whether you're looking to create dramatic backdrops for scrapbook layouts or lace like elements for card fronts, these beautiful and impressive dies are ideal for bringing a touch of regal elegance to all of your paper crafting creations! These dies are part of the Classic Wedding Collection. 1. Straight Medallion Die 1: 5.5" x 2.5", 2. Straight Medallion Die 2: 6.25" 2.75", 3. Arch Medallion Die 1: 5.25" x 2.5", 4. Arch Medallion Die 2: 5.5" x 2.75". Wedding themed craft die from Sara Davies featuring a heart with the words "Mr. and Mrs.". This pack includes 2 metal dies which can create 3 designs. Designed by Sue Wilson these cutting dies are an elegant collection of high quality steel designed to co-ordinate with each other. Contains 4 dies. Sizes: Smallest: 1.75" x 1.40", Largest: 3.35" x 3.35". Designed by Sue Wilson these cutting dies are an elegant collection of high quality steel designed to co-ordinate with each other. Contains 15 dies. Sizes: Smallest die: 0.90" x 0.40", Largest die: 2.10" x 2.10".